The Paul G. Allen School prides itself on having world-class faculty, postdocs, and staff who work together to provide a collegial research and teaching environment and to effectively serve the more than 1,300 students enrolled in our undergraduate or graduate degree programs. 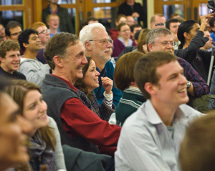 The Allen School faculty consists of 61 core tenured or tenure-track teaching and research faculty; 9 instructors/lecturers; 40 adjunct faculty from other UW schools and departments; and roughly 90 affiliate faculty representing industry and outside research and educational institutions. Together, they offer an unparalleled education and research experience to Allen School students, including more than 900 undergraduate majors in computer science or computer engineering; approximately 50 students in our combined Bachelor's/Master's program; 240 full-time Ph.D. students; and roughly 175 working software professionals enrolled in our Professional Master's Program.